First of all let’s make something clear: Palermo is a highly-populated and lively city, and its inhabitants tend to use the two or four wheels even for a few minutes’ destinations. The result is a busy city where roads are often meant for vehicles rather than pedestrians. Tourists will anyway enjoy the city in a better way by walking throughout the area – an advice that suits any touristic destination. Of course, travelling by feet is not always possible: other means of transport may be required. If you wish to rent villas in Palermo or its environs for your holidays in Sicily, you will need a car to move and visit all the wonderful hamlets, beaches, landscapes and so on. You may rent a car in Palermo as soon as you land in Punta Raisi airport – otherwise you will find a lot of car rental services in the city and in its environs too. As you spend your holidays in wonderful villas in Sicily, the beautiful landscape, the delightful cuisine and the timeless history will make you wish to visit as many places as you can: hiring a car will be the best solution for your holidays in Palermo or in Sicily. Here is some information to consider as you plan your holidays in Sicily villas, destination Palermo (or its environs). “Falcone e Borsellino” – Punta Raisi Palermo airport (www.gesap.it) is 30 km far from the city centre. It’s an International airport, served by the most famous Airlines. If you want to reach the city centre from Punta Raisi you can rent a car as you land in the airport – local and international car rental companies are available. Otherwise, you can reach Palermo by bus: the service is managed by Prestia e Comandè (www.prestiaecomande.it) , the buses leave every half hour every day and stop in the most important sites of the city (Politeama, via Libertà, the port, the central railway station and so on), the ticket is € 5,80 and can be purchased on the bus, and the last bus leaving in the night will wait for the passengers of the last flight landing. If you want to reach Palermo by train, you may check on www.trenitalia.it for the Trinacria Express, special line connecting the airport to Notarbartolo and central stations. Taxis are available from 6am to 12pm. The port of Palermo is connected with the main Italian and Mediterranean ports; you may check www.portpalermo.it for all the details about companies, cruises and timetables. Public transport in Palermo means mostly buses, and underground. The lines of Palermo buses can be found on www.amat.pa.it; together with ordinary lines, three cheaper touristic lines have been created (Red, yellow and green line) crossing the city centre. 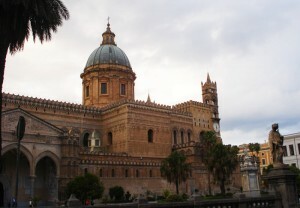 AMAT also connect Palermo with its environs, such as the wonderful Monreale, Mondello and Isola delle Femmine. Tickets cost 1.30 €, must be stamped and are valid for 90 minutes. The most suitable bus lines for tourists are 101, crossing the whole city from the central station to the stadium, and 806, that will bring you to the beaches of Mondello. Two night lines also are available, N1 and N2. AMAT also manages a car sharing activity in Palermo, for which we invite you to check www.carsharingpalermo.it for further details. Tourists can enjoy CitySightSeeing bus service in Palermo too. Two lines will take you around the city starting from piazza Politeama, and a special line will let you visit the wonderful Monreale (departure is in front of the Cathedral); tickets are 24 hours valid and cost 10€. The underground of Palermo is made of two lines: line A connects central and Notarbartolo railway stations to Punta Raisi Airport, while line B goes from Notarbartolo to Giachery station. However, extension and development works are in progress to increase stops and connections. The most important railway stations in Palermo are: Central Station (Stazione centrale), a neoclassical building realized at the end of the Nineteenth century; Notarbartolo Station, built during the Seventies to improve the connection of the city centre with the northern area of Palermo; Orleans Station (Stazione palazzo d’Orleans), the most recent one, lying underground next to three highly-crowded places: the University of Palermo, Piazza Indipendenza and Palazzo dei Normanni (wonderful touristic destinations). Other station are now being empowered in order to improve the connection with suburban areas – such as Lolli station (that will be included in the underground line A), built in the Nineteenth century, today a beautiful evidence of the city’s architecture and industrial style during that period. Last but not least, if you want to take a city tour with a more traditional mean of transport, find the horses coaches in Piazza Verdi, in front of Massimo theater. However, our advice still is to walk through this colorful and wonderful city, turn towards a more unconventional route, and wander among the little roads of the old town centre, where buses, trains, cars and horses can’t go! « Villas in Sicily with pool and introduction !